We landed on the edge of Inner Mongolia yesterday, and today formed expedition parties to strike out into this magical kingdom so full of mystery. How come we are driving across Inner Mongolia, before you get to read reports of what it’s like in Outer Mongolia? Surely some mistake in the Route Book? No, its just the way things are out here on one of the remotest spots on earth that clings to its existence on the back of past reputations as one of the four corners of the earth. And we are only just beginning. Tomorrow, we have the border to cross, get all the formalities for leaving China sorted, and then begin paperwork trails for all 130 cars from 30-odd officials, and with that out of the way, crack into the first of our Time Trials. Everyone is looking forward to tomorrow. 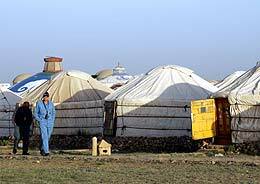 Right now we are in a comfortable hotel in Erenhot, nothing like as much character as our round white Yurts where we all slept out on the plains last night (yes, temperatures dropped to freezing-point, many resorted to their sleeping-bags for the first time) but we have hot running water and much else at the flick of a button. Getting into town was an uneventful romp on a Chinese road, dead smooth and not a pot-hole to remind the suspension that this is supposed to be a rally. We might call it boring, but in a few days time this road might be recalled with fond nostalgia. So, today has been the easiest so far. Yet a good many cars have pulled into the car park lurching and spluttering and kangarooing into parking slots, misfiring on poor petrol. This is worrying, as the fuel quality will be down to 80 octane, or less, in a few days time and if engines are not running well now, they can’t expect to get any better when in the truly remote bits, the inner of outer Mongolia. Here’s a summary of what we know: Today the latest to suffer fuel-starvation is the Buick Coupe of Igor Kolodotschko and Robert Moore, only fixed after a rapid road-side fettle by Igor blowing out a fuel line. It is possible to travel without this sickness as 90 per cent of the cars are running well, but, worryingly, a good ten-per-cent are suffering. Yesterday, The four teams of Mechanic’s 'job list' went like this: Car 55, big pre-war Jaguar saloon of Michael and Sarah O’Shea: fuel pump problems, leak suspected near the fuel pump, filter and fuel pipe problems, car stops many times, rear suspension problems, to be solved by cutting up lumps of wood to turn into axle bump-stops. 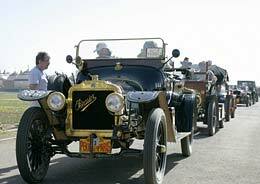 Car 12, Andrew Fulton and Warner Bruntjen, in the big Essex running in the Pioneer Category, recurring problems to vacuum pump, eventually fitted foot-pump to pressurise the fuel system and use a hand-pump; Car 70, Werner Esch, La Salle Cadillac, re-routed fuel pipe as hot engine is causing vaporisation; Car 110, Nigel Barton and Tom Roupell in the Ford V8 Pilot, arriving about 11.0pm last night just after the restaurant had packed up, having nursed the car all day with fuel starvation problems, car also needs to change the alternator as well as fit spare fuel-pumps; Car 18, Vauxhall Prince Henry of Michael Power in the Pioneer Category, fuel pressure problems, Car 52, Jan Dingemans in the big Mercedes 630K, help out with puncture repair; Car 86, the Finns, Martii and Pirkko Kiikka, in the white Packard, broken rear suspension, bent shock-absorbers, broken shock-absorber mountings - most cars are carrying far too much weight and yesterday’s diversion forced on most by the local policeman onto a dirt road proved the first real shake up. If cars are having problems after this stretch, it does not bode well for what is to come. Cars that go into Mongolia can only come out in a shipping container - the Chinese are not allowing a truck with a car on its back to limp back across their border, and most entrants only have single-entry Chinese visas, so, those that go into Mongolia tomorrow have only one real way out - crossing this vast country to Russia, which will be more than ten days time. The Model T Ford of Scott Anderson and Gary Fisher arrived into the Yurt campsite last night at three in the morning, the crew were up at first light fettling the car, having suffered electrical problems caused by vibration loosening a few essential wires (looking under the bonnet there are hardly any wires, this car is as simple as a Hornby train-set), but it suffers from a lack of power on the hills. Electrical problems have been few, but the bright-red Itala of Jonathan Turner and Adam Hartley had to be given a short tow to bump start the car back into life in the middle of nowhere yesterday after it was found that the batteries were flat. It was one of the last to arrive yesterday and came into the camp guided by the lights of John Quincy’s film unit. The Aston Martin DB6 of David and Jon Goodwin suffered a bent anti-roll bar which was forced up into the front springs after a bad landing yesterday - the brilliant tarmac that ran up the side of the mountain ended abruptly with a nine-inch drop onto baked clay dirt and at speed this was enough of a jolt to bend the front suspension due to the heavy landing, the dead-smooth tarmac had lulled many into a sense of well-being and most were brought down to earth and back to reality with this jolt. So, ten per cent are having problems and we are only just getting out of China. Yet the atmosphere and the camaraderie is remarkably happy and the crystal air of Inner Mongolia is full of optimism. Last night saw competitors singing Ging-Gang-Goolie round a campfire, with Mongolia costume dancers, fire works, and we awoke for a late-breakfast start in bright sunshine with riding skills on display on the vast grasslands that roll out from the little windows of our Yurts... more of this sort of thing to come.